I'm in the slow process of converting from this blogspot to my own website, ReadingCatholic.com. But I've decided that while things are still quite "rustic" over there, and I'm learning my way, it makes more sense to invite you to visit me over at the new site. I did a few posts on both platforms, but posting on the new site exclusively makes the most sense. So come visit me at ReadingCatholic.com And be sure to say hello! Today I'm sharing about what we are doing to celebrate Benedict XVI as well as the conclave. This weekend my March column and other content that appears in print edition of The Catholic Post will post there, and gradually you'll see a great shiny new and improved site. As always, I welcome reader comments and ideas. P.S. Sorry for the broken link to the new site! I believe it is working now. Worth a Listen: TobyMac's "Speak Life"
(Sharing great songs that are inspiring, uplifting and/or are otherwise "worth a listen"). Explanation (of a kind) here. I asked my teenage daughter to help me come up with some videos to share here for "Worth a Listen." Fortunately, we both like the same kind of music. I love this song so much, and while I normally don't like lyric videos, this one is beyond great. It's also the official lyric video from Toby Mac, so that helps. Okay, I just want to put all the lyrics here. Go listen to the whole song, and smile. Then speak life. As I shared yesterday, I've written a couple of articles for The Catholic Post's last print issue. One that didn't make it to The Post website was a story about the terrific First Saturday gathering covered for The Post the First Saturday gathering, "Authentic Friendship in an Age of Social Media" last month. What a fun, lovely evening--I for one am so grateful to people like Marie from "Help Them to Heaven" and the First Saturday team, a group of great women, for organizing the event. I very much enjoyed the real life time with friends, getting to meet some people I didn't (including one that I taught when I was briefly a high school teacher! ), and just having an all-around enjoyable time. I'm going to share some photos, as well as a version of the print story. As I mentioned yesterday, most of the photos I took with my husband's very nice camera all came out looking like cell phone snaps, and I do promise to learn how to use it better before I use it again. So be forewarned, but I think the smiles and the fun make up for it. 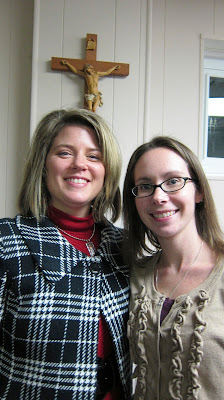 Here's Bonnie Engstrom of A Knotted Life and Lisa Schmidt of The Practicing Catholic (one of the evening's speakers). As you can see from the sidebar, I truly consider Lisa an honorary member of the Peoria diocese (along with Sister Helena Burns, the other speaker. Lisa is just lovely in person. Here is Lisa with Dianna Kennedy of The Kennedy Adventures. She is one of a group of bloggers from other states who were hoping to make it to the Authentic Friendship talk. It was kind of like Behold Conference "lite," since there won't be a Behold until 2014. (Never fear--plans are already underway for the 2104 Behold Conference, and I'm delighted to be part of it). Unfortunately, the weather was icy Friday night into Saturday morning, so the rest were unable to travel. Again, Dianna is beautiful and so incredibly much fun to be with. I'm not sure if it's her southern accent, her spunky one-liners, or her high energy, but she was like a jolt of java to be around. Dianna had asked before her trip if any of us local ladies were runners and wanted to run with her. She's training for a half-marathon, and so I and another local woman (who is also training for a half), made a plan to run Saturday morning on Grandview Drive. The icy weather forced us to cancel, but I am definitely taking a rain/ice check on that one, since she would be a great running buddy. The miles would fly by running with this gal. Here are Bonnie and Marie. Because Moms who take photos are so embarrassing. That's better! As you can see, teen is still exasperated by her mom. Here is the dinner before the First Saturday gathering. And Lisa Schmidt again with Marie. Lisa is very photogenic! There were also various other photos, including several funny ones of Lisa Schmidt and Sister Helena that inspired laughs on Facebook, but I will let Lisa Schmidt incriminate herself with those. Online relationships offer the opportunity for “deep friendships” and evangelization, two new media experts told a group of Catholic women. “Authentic Friendship in an Age of Social Media” was the topic of the February 2 program at St. Philomena Church in Peoria. The talk was sponsored by the “First Saturday” program, a monthly gathering open to women of all parishes, ages and vocations. According to Marie Meints, a member of the seven-women team from various Peoria-area parishes, First Saturday focus on fellowship and discussion for women seeking to grow in holiness in everyday life. More than 60 women gathered for the February 2 talk, from around the central Illinois area and beyond. About half that number gathered for a pre-talk dinner. Sister Helena Burns, a Daughter of St. Paul, who is based in Chicago, IL, but travels the country speaking about media literacy, “Theology of the Body,” and online topics, spoke on how the Internet is an vital place for Catholics to be and to find friends. “I was surprised by the deep friendships you can have in 140 characters,” said Sister Helena, referring to the length of Twitter status updates. Sister Helena explained how Father James Alberione, founder of the Daughters of St. Paul, told his followers to “use the fastest and latest means” to spread the Gospel message. In the 21st century, blogs, social media such as Facebook, and other online platforms, is the “fastest” means to reach people and foster friendships. That doesn’t mean doing things perfectly all the time. “You’ve got to make some mistakes online,” Sister Helena said, and shared times that she had been too hasty, or too trusting, in her online interactions with others. Making mistakes is part of the learning process. Blessed John Paul II’s “Theology of the Body” provides a template not just for married love, but every relationship, including and perhaps especially those online, according to Sister Helena. Lisa Schmidt, from Des Moines, Iowa, who blogs at “The Practicing Catholic,” (www.thepracticingcatholic.com), also spoke at the “Authentic Friendship” program. Schmidt, who lives with her husband and two small children in Des Moines, Iowa, shared how “spiritual friendships” helped her conquer the loneliness that she felt when she left her career in city management in Iowa to stay home with her then infant daughter. At the same time online life can be good for the soul, knowing when to “unplug” and connect in real life is critical. Sister Helena argued that there are three “sacred places and sacred times” we don’t need “screens,” whether televisions, computers or mobile devices: at church, in the bedroom, and the dinner table. Sister Helena explained a new tradition to promote real-life intimacy called a “phone stack” used by some young people while eating out. At the beginning of a meal, all leave their phones stacked in the middle of the table. The first person to reach for his or her phone pays for the meal. Well, I've been pretty light in posting on the blog this month. Real life has been especially busy, and I find that the beginning of Lent is a low-energy time for me. Maybe it's because I'm without the staff of life--chocolate? That's my excuse, anyway. In any case, I have been busy writing, though, as well as doing some behind-the-scenes work on the blog. In the last edition of The Catholic Post, I had two news articles. I told a few friends that I was amazed at how long it took me to write these articles, when I used to write multiple articles in a day, no problem. Of course, back then, I didn't have a husband, children or a household to keep running. Part of it too was that I was in the habit of doing so, and could easily crank out a lot of words easily. Writing news stories takes a lot longer these days for me. But I did enjoy the challenge. Let me share first The Catholic Post link to my article on Abby Johnson's appearance at St. Jude in Dunlap. I saw many familiar faces there, and it was great to catch up, as well as get the chance to interview Abby before her talk and get the scoop on her new book (of course I asked) called The Walls are Talking. Here is Abby giving her talk. Here is a photo I submitted to The Post, but that didn't make it in, of Abby signing a book for Anne Whitmore, a member of St. Jude parish and a friend of mine. Anne and Abby were both good sports about "acting natural" for the paper. Here is a sadly too dark--even after editing--photo of Bonnie Engstrom with Abby. And here's another too dark one, and blurry, photo of Bonnie and Abby. And here's yet another (dark) photo of the beautiful Marcia, and her beautiful daughter. Clearly, I need to get a major tutorial from my husband on how to use his camera. He let me borrow it that evening. Whenever he takes photos with it, they look like from a professional photographer. When I use it, all that I get is ....bad cell phone snaps. Did you go to the Abby Johnson talk? What did you think about it? Soon, I will post about my other story for The Catholic Post this month. Worth a Listen: Britt Nicole's "Headphones"
Yes, I am a hopeless Britt Nicole fan. This is another great song and video from her. Delivering Unity Campaign--Are you a Locavore? You know that trend to be a "locavore" when it comes to food, sourcing your food as locally as possible? How about your Catholic news? Those who contribute to the campaign automatically receive 26 biweekly print issues of The Catholic Post mailed to their home. Bishop Jenky encourages all who are able to give beyond the traditional $25 subscription investment – even if only $5 or $10 more – to consider doing so as a practical way to evangelize inactive Catholics or to provide Catholic reading for households struggling in this economy. The editor of The Catholic Post Tom Dermody (referred to often as "my editor" here) is multitalented, as he narrated and appears in this video, "Ignite Your Faith," and he also wrote the background music for it. I really enjoyed watching this video, and it inspired me to make our family's annual Lenten donation to this campaign. The online form couldn't be any easier to fill out. I hope it will do the same for you if you are connected in any way to the Peoria diocese. Do you receive the print edition of The Catholic Post? Consider giving a gift to the campaign to ensure that you always receive a copy, and offer others within the diocese the opportunity to receive the newspaper. My husband Joseph and I have just been in shock this morning about the news of Pope Benedict XVI resigning. Looking for another intention to pray for this Lent? @pontifex resigning and the election of a new Pope is a good start. How interesting, too, that this news breaks on the World Day of the Sick and Our Lady of Lourdes. "After having repeatedly examined my conscience before God, I have come to the certainty that my strengths, due to an advanced age, are no longer suited to an adequate exercise of the Petrine ministry. I am well aware that this ministry, due to its essential spiritual nature, must be carried out not only with words and deeds, but no less with prayer and suffering." My husband, with his interest and knowledge of all things Catholic, starting sharing about the last pope to resign. New Advent has the Catholic Encyclopedia about the last pope to resign, Celestine V. It's not unprecedented, but it is really surprising. We've had an interesting discussion here. On the one hand, as Joseph mentioned, Pope Paul VI spoke about how it was important for people to see the Holy Father die in office. Consider how Pope John Paul II's decline and death showed a generation the beauty and nobility of that. On the other hand, Pope Benedict XVI resigning shows that stepping down is also a viable option, and strength and holiness can be shown through that. This may not seem like the best way to say this, but there are many ways to grow old. Blessed Pope John Paul II showed us one very public way, and perhaps Benedict XVI is showing us another, quieter way, more suited to his quiet personality. Here's a brief article from Vatican Radio (and update, here is Rocco Palma's first, thorough analysis) detailing some of the specifics: Benedict XVI will not participate in the conclave to elect the new pope (and he is also too old to vote in any case). He will move to Castel Gandolfo after his resignation becomes effective, and he will live in private apartments at the Vatican. Joseph and I both thought he might have moved back to Germany to live out his final days there. We just watched Cardinal Dolan interviewed on the Today Show, and he appears just as surprised as everyone. Consider, too, that the Holy Father won't be like a former president. The media won't get to interview him and ask how "the new guy" is doing. He will be living a completely private life. Can we join in prayer as we approach Lent? I will be considering how prayer for Benedict XVI, as well as the new pope, will be part of my Lent. Any special ideas you have to make this a fruitful Lent in prayer for the Holy Father and his successor? Worth a Listen: Royal Tailor's "Make a Move"
copyright © Nancy Piccione. Simple theme. Powered by Blogger.